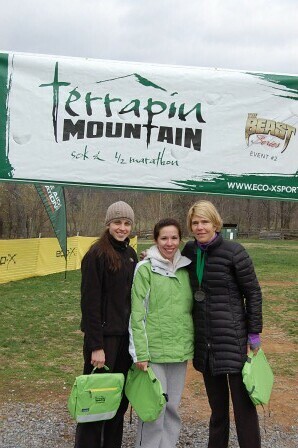 The weekend I had the privelege of running the Terrapin Mountain 50k for the 2nd time. The short version of the race report is: Not enough training, very sick all week before the race, decide to at least start and see how I feel, go out slow, feel better and better throughout the race, beat last years time by about 12 minutes. The longer version is below. 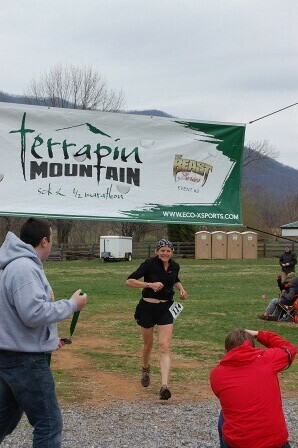 I ran Terrapin Mountain last march as my 3rd ultra and first mountain race and immediately fell in love. It's not that flatter courses aren't good, because I like them too, but there is just something I love about running through the mountains. After running it the first time, I decided that I had to come back and run it again if I got the chance. Because I go to a military school I have lots of friends who are runners. This year when I signed up I started asking my friends if they wanted to come run too, and I managed to get two to come run the 1/2 marathon as their first trail race, and three to come run the 50k. Two of them were first time ultrarunners (including my girlfriend), and for one, it was her first race longer than 10k. Leading up to the race, I got busy with school and life and failed to do any really meaningful training. I decided a couple weeks before the race that I would go and plan on running slowly if I had to, but I figured I would have no trouble finishing within 9 hours. I figured this would work fine, but then when race week rolled around I got very sick. I thought it would pass before the race but as the week went on I got sicker and sicker. Late in the week I was scheduled to have a fitness test, and Friday when I took it I got dizzy after each event. I decided that I would drive down with my friends that were running, but unless I was suddenly better I wouldn't run. When I woke up Saturday morning I still didn't feel fully healthy, but I felt good enough to start and see how it went. I started the race with my friends, but we quickly dispersed on the first climb up to the Camping Gap aid station. I decided to hold back a lot since I didn't know how my legs would react to so little training. After the aid station I let my legs go a bit to see how the felt. Everything felt great so I ran a pretty good pace all the way down past the 2nd aid station until the bottom of the mountain. I decided that for now I would just keep up the pattern of relaxing on the climbs and pushing the downhills. This worked until about mile 16. By the time I left Camping Gap for the 2nd time to head up the White Oak Ridge loop I was starting to realize that I didn't really feel sick anymore. I actually felt really good. I hiked up to the top, punched my bib, and then cruised on down back to Camping Gap for the third time. I was feeling really good, but having lost one of my gaiters after Grindstone, my shoes were getting lots of stuff in them so I took a short break and dumped out my shoes. I hiked up Terrapin, passing a couple people on the way up and realizing that I felt much better than I had at that point a year ago. Then I was hating life, taking breaks every so often and wondering why I had ever wanted to do something like this. This time it didn't seem so bad. At the summit I got a picture and headed down. I had been dreading the descent, because remembering it from last year it had been horrendous because I couldn't run the steep and rocky parts, but this time it gave me no problems at all. I ended up passing quite a few people on the way down and never had any trouble with the rocks. 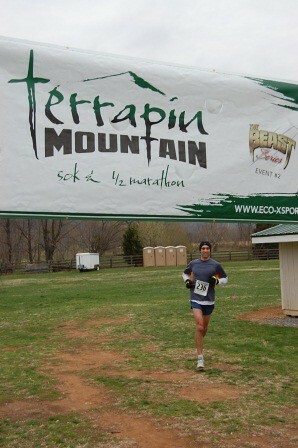 I kept waiting to hit the wall and start feeling like crap again, but by the time I hit the last aid station at Terrapin Mountain Lane it still hadn't come. I looked at my watch, and despite expecting a really slow finish due to being sick and undertrained I realized that I was on track to finish a little faster than last year. At this point I started pushing. 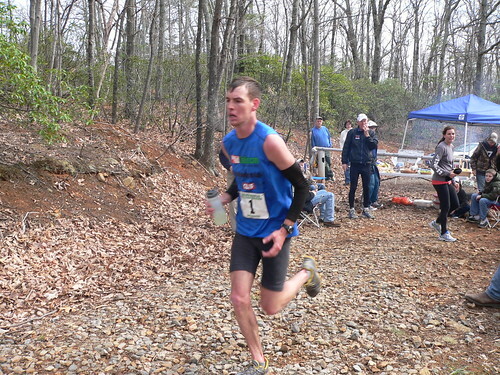 I ran anything uphills that weren't to steep, and pushed it hard on downhills and flats. I decided to see how much I could beat my previous time by, and so I had constant motivation to keep pushing it. Eventually I reached the road and gave it as big a kick as I could still mangage. I was still feeling pretty good, and so I even managed to sprint the last 50 yards or so and get a good heel click in as I crossed the finish in 6:34, 12 minutes faster than last year. Pretty good for almost no training and being sick for a week. I've been thinking about it since, and I'm still not sure how it happened. The only thing I can think of is that the year of experience helped. My friends all loved their first mountain race. Emily (my girlfriend) won her age group with a 6:23, my friend Jake won his age group with a 5:42, and my friend Ashley ran a 7:02 in her first race longer than a 10k. I pretend to be disappointed that two of them beat me, but really I'm pretty happy. I'll just have to train more now. In a month Jake and I will head back down to the mountains to run Promised Land. This time it will be my roommate coming with us to run his first ultra. Congratulations to our 50km men's champion! Click on these racers names to see their times and entire race profile on eco-xsports.com. Click here to see all the 50km ultra run stats online. Congratulations to our 50km woman's champion! Congratulations to our top 3 men finishers in the half-marathon. Click here to see all the half-marathon stats online. Congratulations to our top 3 women finishers in the half-marathon. As we have access to the internet on location around the race course we will be posting blog updates, answering Facebook questions and requests as well as posting photos of the race and splits as they come in at each aid station. Use these links to get all your race information. The webcast will begin tomorrow(3/26) between 7am and 7:45am.